What you'll pay for a life insurance policy can vary dramatically; men pay higher premiums than women, older policyholders pay more than younger ones and smokers pay more than non-smokers. But just how much does your age, gender or smoking habit cost you? InsuranceQuotes.com evaluated life insurance premiums for the top 25 carriers in the nation to find out. Men pay an average of 38% more than women for the same coverage. Here's one area where women have a financial edge. Men are at a greater risk of cardiovascular disease, various cancers and accidental injuries and that makes them more risky to insurers. The average life expectancy of an American man is also five years younger than a woman's, meaning an insurer is more likely to pay out on a man's policy than a woman's. 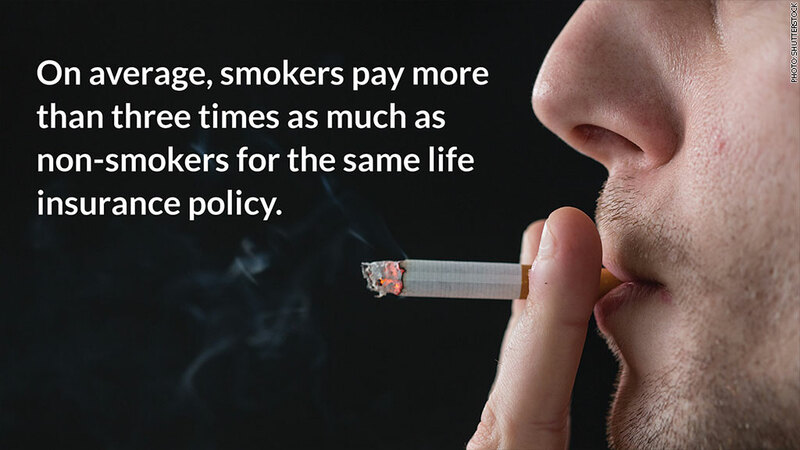 Smokers pay more than three times as much as non-smokers for the same policy. Insurers can charge smokers three times as much as non-smokers, insuranceQuotes.com found. A non-smoking 45-year-old woman, for example, pays $45 a month for a $500,000 term life policy. If she smokes, however, the premium shoots up to $167 a month. That's $1,462 more a year. If you can kick the habit, however, you can save big. Tell your insurer that you've been smoke-free for two years and they will usually lower your premium to the rate for non-smokers, said Laura Adams, an analyst for insuranceQuotes.com. "That's pretty generous," said Adams. "It's almost like you never smoked." But don't tell your insurer that if it's not true. If you do die of a smoking-related cause and your insurer finds out you never quit, they can deny the benefit entirely. Most people don't feel the need to buy life insurance until they have a child. And in general, that's a pretty good rule of thumb. If you have children in your 20s or early 30s you could save significantly on premiums by opening a policy while you're young. Premiums for 35 year olds cost about 27% more than those for a 25 year old. "Term life [policies are] popular because they're relatively inexpensive and people don't need policies for their entire life," said Adams. Many parents buy 20-year term policies to see their children through their college years.